Ivory off-shoulder lace bolero jacket WJ010. *Email addresses in comments are ONLY used to contact the winner. They will not be shared with the public or used for promotional purposes. The winner will be announced on Friday, Aug. 9. Beautiful wedding jacket! I wish I could win it! Thanks so much! Wow! This bolero will sure match my dress perfectly. I like the off shoulder style so much! i would love to win this bolero! Im trying yo comment everyday...so excited hope i win!!! Would love this bolero to go with my ivory strapless wedding gown! I love this bolero! Pick me please! Love this bolero! Hope to win! This would make a dress fit for a church! I love this beautiful lace bolero! I want it for my wedding! Hello! This is the EXACT bolero I have had my eye on for my fall wedding! Thank you for doing this giveaway!! I would love to wear this beautiful lace bolero! I just liked this giveaway on Facebook. Thank you for having this contest! I "liked" you on facebook!! My fiancee could not be more beautiful, however I know she would be so happy to wear this on our special day! And I liked your page on facebook - thank you so much! This is stunning. I like it so much. This would go so perfectly with my sisters dress, so beautiful!!! This is a beautiful jacket! Keeping my fingers crossed for this lovely jacket! Back again to wish for this jacket for my fiancee! What mother wouldn't want a bolero like this for their beautiful daughter! 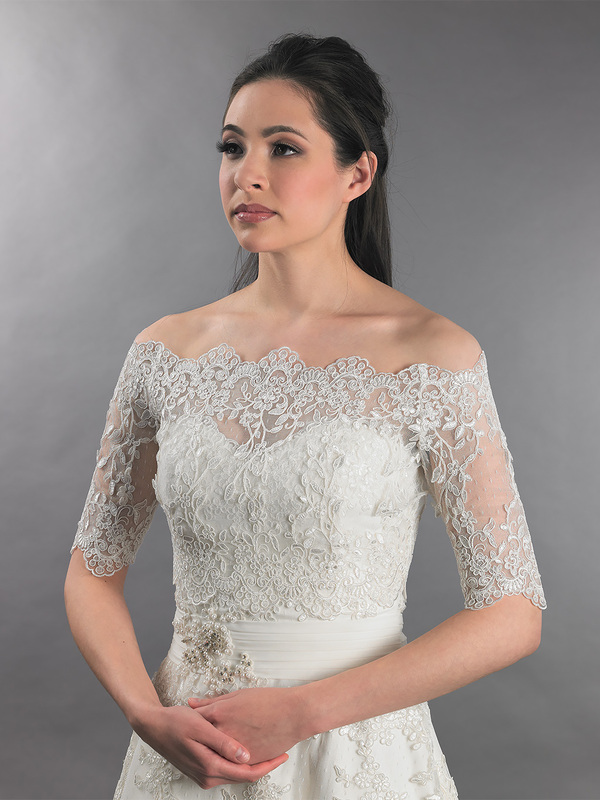 hoping to win this beautiful lace bolero! would go perfectly with my ivory strapless fit and flare gown! Thanks for offering such a great jacket give-away! Hello! Thank you for doing this giveaway! Fingers crossed!! I am buying this either way!!! This is my dream! hoping I win only two days left! This is the perfect way to complete a bride's ensemble! This is exactly what I am looking for! How wonderful! This is such a great give-away - it would make a wonderful addition to my daughter's wedding! Seriously, can't get over how beautiful this is!!! I can't wait to find out the winner! Loving this jacket. It makes the dress so sofisticated!!! this is beautiful! i know an amazing bride this would look gorgeous on!!! Thank you again for the giveaway! I have your page bookmarked for tomorrow!! Looking forward to hearing the winner! I know they will be so happy!! Last day to enter ! !excited to find out who wins this gorgeous bolero I hope its me but I never win anything lol..thankz tulipbridal for thus giveaway! So excited to hear the winner! Can't wait to hear who the winner is. Thanks again for this giveaway!